OMG! These are so good! I used this recipe from Smitten Kitchen. I also made a little maple butter to go with them. I used a 1/4 cup of softened butter and mixed in a tablespoon or so of maple syrup. Words just can't describe how good it was! Thank you all for all your kind comments on my "Sampler Stocking." I've been working on "My Lady's Quaker," but I don't have enough progress to show a new picture. Hopefully tomorrow! Well, it turns out I'm not able to go to Myrtle Beach in October after all. I had promised my mom I would go down to Florida when the kids had a four day weekend next month. Well, it turns out that it's the same weekend as the Pals Fall Fling. I would cancel going down to Florida, but my mom is going through a really hard time right now and it's the only time that the kids have off until Thanksgiving. I felt really bad when I emailed Amy today to let her know I couldn't go. I hope she understands! Sorry again Amy! Well, I've got to get back to cleaning. Write later! Sounds so good! Thanks for the link to the recipe -- I'll have to make my hubby bake some. Sorry you're going to miss out on the Pals thing. Why is it that things always have to conflict? I wanted to take a Catherine Theron class but I had to pass it up since it's the same day we're taking my daughter back to college. Family comes first! They look good. 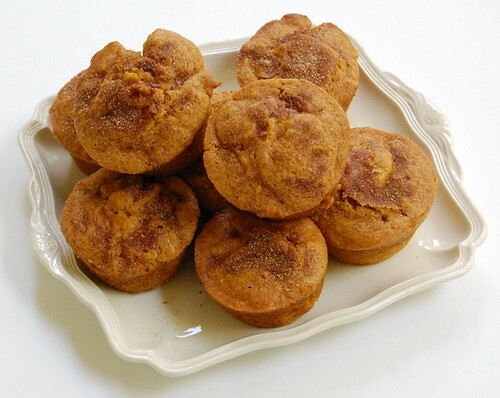 I saw something in a magazine (I can't remember which one now) that had a recipe for pumpkin cupcakes...ymmmmm! Yummmmm. I love everything pumpkin. Oh wow, I can almost smell them through the screen, lol! they look good. Sorry that you can't go to the Pals fall Fling. I was hoping to meet you. My husband and I are drooling! LOL Those looks wonderful! sorry to hear you can't go to PALS this year. I am bummed that i am not able to make it either and hoping next year will work out for me to get there. Those muffins look yummy ! Nicole, yummmm! Those are some fantastic looking muffins. One with coffee right now would be perfect. Your Sampler Stocking is stunning and I love the way it turned out! It looks really nice on the Meadow Rue. And now I have to add it to my "want to stitch list." Yumm! Thanks for the recipe link. Sorry to hear that you'll miss getting together with friends. I'm sorry that you can't take your trip to Myrtle Beach - I understand family obligations too well!